These triple-layer brownies have an interesting blend of flavors and textures, from the soft, sour topping, to the creamy cheesecake layer, to the chewy brownie on the bottom. As usual for brownies and cheesecake, the recipe works well gluten free. Center a rack in the oven and preheat the oven to 350°F. Butter and flour a 9-inch square baking pan or spray the pan with baking spray. Whisk the flour, baking powder, and salt together in a medium bowl; set aside. Melt the butter and chocolate together over medium-low heat in a medium saucepan, stirring with a rubber spatula until the two have melted into each other. Take care not to heat the mixture too much – you don’t want the butter to separate. Turn off the heat and remove the pan from the stove. Add the eggs, one at a time and beat well after each addition. Whisk in the vanilla extract and whisk vigorously for just a few seconds. Set the pan aside while you make the cheesecake batter. In the bowl of a stand mixer fitted with the paddle attachment or with a hand mixer and large bowl, beat the cream cheese on medium until it is smooth. Beat in the sugar and continue beating for 3 minutes. Add the eggs one at a time and beat each for 1 minute before adding the next. Reduce the mixer to low and add the sour cream, followed by the flour. The batter should be smooth. Stir up the brownie batter a couple of times and spread 3/4 of the batter in the prepared baking pan – the batter should cover the entire bottom. Pour all of the cheesecake batter over the brownie batter and using a spoon or offset spatula, cover the brownie batter entirely. Dollop the remaining brownie batter over the cheesecake batter by the tablespoonful and using a knife, just barely swirl the brownie batter around, taking care not to dip the knife into the bottom layer of brownies. Bake for 30-35 minutes. The brownies should just pull away from the sides of the pan and the cheesecake layer should be beige in the center, slightly browned on the edges, and puffed all over. Transfer the pan to a wire rack and cool to room temperature. Transfer the brownies to the refrigerator and chill for 2 hours. In a small sauce pan over low heat, warm the sour cream OR yogurt and sugar together, stirring constantly until the sugar has dissolved. Pour the topping over the chilled brownies and using an offset spatula, push the topping just out to within ¼-inch of the edges – don’t let the topping spill down the sides. Chill the brownies for another 1 hour. To cut the brownies, run a long sharp knife under hot water and dry with a towel. Cut the brownies into quarters with the hot knife, cleaning and reheating before you make each cut. Remove the quarters from the pan and cut each into quarters. Keep the cut brownies chilled and bring to room temperature before serving. This is a style of cheesecake that I grew up eating. It has a moist cake base studded with peach chunks, and the cream cheese layer is light and fluffy and even slightly caramelized. Preheat oven to 350ºF. Grease the bottom and sides of an 8″ x 8″ baking pan. In a large bowl, mix together egg, milk, and butter. Add flour, pudding mix, and baking powder. Mix well. Pour batter into pan, spreading evenly across the bottom. Drain peach chunks, reserving the syrup, and scatter chunks evenly across batter. They will sink in, but that is expected. In a clean bowl, beat together cream cheese, 1/3 cup of the reserved syrup, and sugar. Spread evenly across the mixture in the pan. Bake for 55-65 minutes if gluten-free, 45 minutes if not. In the gluten-free version, the top of the cream cheese layer will caramelize but the inside will still look wet and bubbling. It will solidify as it cools. Cool cake completely and cut into squares. Refrigerate any leftovers. This cheesecake is rich and creamy and translates well to gluten-free-ness. With a hot water bath during baking, it’s a little scary to remove the pans from the oven, but I found that placing the pans on a large baking sheet decreases the risk of burning yourself. If you’re impatient and don’t mind a slightly warm cheesecake, you can eat it the same day you bake it. Position the rack in the center of the oven and preheat the oven to 350ºF. Butter or coat with nonstick spray, the bottom of a 9-inch springform pan. In a large bowl, assemble all the ingredients for the crust. Mix them together with your hands. If using nuts, the mixture will resemble very small pebbles. If using only flour, the mixture will resemble damp sand. Press the crust into the bottom of the springform pan, covering the base completely and evenly. Wrap heavy-duty aluminum foil, or two layers of regular foil, around the pan’s bottom and halfway up its sides, pleating the foil to tighten it securely. Bake the crust for 10 minutes. Because it’s gluten free, it will remain light in color. Remove from the oven and set aside. To make the filling: Put the cream cheese, sugar, and salt in the large bowl of an electric stand mixer fitted with a paddle or beaters or in a large mixing bowl. Using the stand mixer or a hand mixer on medium speed, beat the ingredients until smooth, stopping often to scrape down the sides of the bowl and under the blades with a rubber spatula. Turn the speed high and continue to beat until mixture is creamy. Stop the mixer and add the sour cream OR plain yogurt, rum, lemon juice, and vanilla; then, on medium speed, continue beating until well blended. Add the eggs and beat just until combined. Scrape the filling into the prepared springform pan. Bring a kettle of water to a boil. Place the springform pan inside a slightly larger baking pan. Use an oven glove, pull out the oven shelf and place the baking pan on it. Pour enough hot water into the pan to reach halfway up the sides of the springform pan, but not above the foil. Carefully slide the shelf into the oven and bake the cheesecake until its top is slightly golden and slightly firm in the center, about one hour and 10 minutes. Carefully remove the baking pan from the oven. Lift out the springform pan and place it on a wire rack to cool, carefully folding down the foil on its sides to promote quicker cooling. When the pan is cool enough to touch, completely remove the foil and continue cooling. When the cheesecake is completely cool, cover the pan loosely with a clean sheet of foil and refrigerate overnight. When ready to serve, remove the cheesecake from the refrigerator. Dip a long, sharp knife in warm water and run the knife around the inside of the springform pan to loosen the cake. Remove the outer ring. Continue to dip the knife into warm water as necessary as you cut neat wedges. I first tried Japanese souffle cheesecake on a visit to Taiwan and really liked it. As its name suggests, it’s fluffier and lighter than American cheesecake. The gluten-free version is somewhat crumbly, but if you use a sharp knife and clean off the blade between cuts, that should help. Measure out cream cheese, butter, egg yolks, and heavy cream, and bring them to room temperature. If you feel motivated, lightly grease bottom and sides of a 9″ springform pan with cooking spray and line with parchment paper. This will make the sides of the cheesecake look tidier and make removal easier. However, I just served it directly from the base of the pan, so I skipped the extra step. Wrap base and sides of pan with aluminum foil, preferably extra-large heavy duty foil. Make sure the foil comes up the sides to prevent seepage from the water bath. Center rack in oven and preheat to 320°F. Boil water for water bath. While water is coming to a boil, in the bowl of a stand mixer fitted with a paddle attachment, or in a large bowl with a hand mixer, beat cream cheese and sugar on medium-high speed until smooth. Beat in butter and mix until smooth. Beat in egg yolks and heavy cream and mix until smooth. Beat in lemon juice and rum and mix until very smooth. If desired, sift flour twice before beating it in all at once. (I skipped the sifting.) Again, mix well. Pour batter into a large bowl. Wash mixer bowl and dry completely. 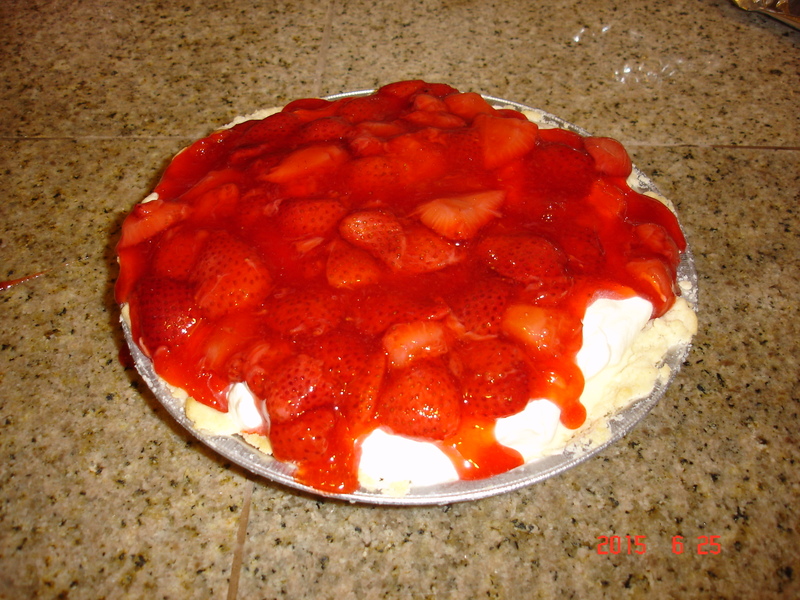 Any oil or water will prevent the meringue from fluffing up properly. In the clean, dry bowl, beat egg whites on medium-low speed until foamy. While continuing to beat, pour in sugar in three additions. Beat on high speed until meringue forms stiff peaks. It should double in volume and look thick and glossy. Don’t overbeat, or you won’t be able to fold the meringue into the batter properly. Add 1/3 of the meringue to batter and mix well to lighten batter. Add the rest of the meringue in 2-3 more additions, gently folding it in with a rubber spatula. Pour batter into pan and drop the pan from a height of 2-3″ onto the countertop to remove any air bubbles. Set cake pan in large roasting pan and pour in boiling water until it comes 1″ up the sides of the cake pan. Bake for 60 minutes, or until light golden brown. Lower temperature to 300ºF and bake for 30 minutes longer, or until a toothpick inserted in the center of the cake comes out clean. Don’t worry if the top has cracked a little. Turn off oven and crack the door open. Let cake sit in oven for 15 minutes so it can cool gradually. Take cake out from oven, remove aluminum foil, and place springform pan on wire rack to cool. In a small bowl, heat jam and water in microwave for 30 seconds. It will be very runny. Spoon jam glaze onto cake and spread evenly with the back of the spoon. Cool cake completely, transfer to serving platter, and refrigerate for a few hours before serving. (Or you can just leave the cake in the pan.) Cover to prevent it from picking up any other flavors. To serve, cut cake with a fishing line or a warm knife. For the cleanest cuts, run knife under hot water and wipe off before each cut. Cake can be stored, covered, in refrigerator for up to 3 days or in the freezer for up to 2 months. Just defrost at room temperature while covered. The glaze looks best the day it’s applied, so I would store the cake unglazed. This recipe comes from Mary Engelbreit and was originally a chocolate-amaretto cheesecake. To avoid anything almond related, for my friends with nut allergies, I turned it into a chocolate-vanilla cheesecake. For a gluten-free crust, you’ll need to make your own chocolate wafer cookies, but luckily this is not difficult! I’d recommend baking them in advance, though. Preheat oven to 350ºF. Wrap the bottom of a 9-inch springform pan in aluminum foil so that the foil comes halfway up the side. In a small bowl, combine butter and chocolate wafer crumbs. Gently press mixture into the bottom of the pan. Bake crust for 10-15 minutes if gluten free, 10 minutes if not. Transfer pan to a wire rack to cool. Leave the oven on. In the large bowl of an electric mixer, on medium-high speed, beat cream cheese until light and fluffy. Scrape down side of bowl, add sugar, and beat until well blended. Scrape down side of bowl again and add eggs one at a time, beating until blended. Beat in vanilla and salt. Transfer half of the mixture to a medium bowl. If using amaretto and almond extract, add them to one bowl now. Beat until combined. Beat semisweet chocolate into the other bowl, then pour into pan and smooth the top with a spatula. Slowly pour the white layer on top of the chocolate layer, smoothing the top with a clean spatula. Bake for 30-35 minutes, or until almost set. The center will still be jiggly when you shake the pan. Turn off the oven and prop the door open with a wooden spoon. Let the cheesecake sit there for 1 hour. Remove cheesecake from oven and run knife around the pan edge to loosen it. Transfer pan to a wire rack to cool completely. Cover with plastic wrap and refrigerate overnight (although if you’re impatient, you can also eat it the same day). Cut cake with a large knife dipped in hot water and wiped clean between each slice. 1. Preheat oven to 475ºF. 2. Mix gluten-free flour and salt in a bowl. Cut butter into the mixture until pieces are the size of small peas. 3. Sprinkle in water while tossing with fork to moisten the flour. 4. Gather the pastry into a ball and place on well-floured surface. You can try rolling it out, but the dough will be fairly crumbly. I usually flatten it somewhat with my palms and then press it into the pie tin. 5. Prick bottom and sides with fork. Bake for 10 min. Cool while you make the filling. 1. Beat cream cheese until soft and fluffy, then slowly beat in condensed milk until smooth. 3. Pour filling into cooled crust, cover, and freeze until firm (about 6 to 8 hours). Leaving it in the freezer for a couple days longer is also fine. 1. Combine strawberries, sugar, lemon juice, tapioca starch, and water in a medium, heavy saucepan. Let sit for 15 to 20 minutes. 2. Cook over medium-low heat to a simmer, stirring. Cook for 2 to 3 minutes more, then remove from heat and chill sauce completely. Keep in fridge until needed. 1. Whip cream with sugar and vanilla until soft peaks form. 2. Spread the whipped cream over the frozen filling and return to the freezer until firm (10 min to an hour, depending on how firm you want it). When serving, cut slices of pie and spoon strawberry sauce over them.